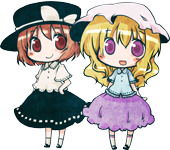 Here's an era of Touhou history that doesn't get talked about much. In the years between the release of Mystic Square and Embodiment of Scarlet Devil, ZUN graduated from university and got hired by Taito. 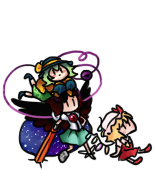 It's normal for young japanese programmers to completely cease their doujin activities once they get hired, but ZUN continued to contribute to the Seihou Project as a music composer. He also made some arranged versions of his old compositions which were posted at his site, on a (now hidden) page called "東方幻想的音楽". At the time, most simple doujin games were distributed in low capacity floppy disks and download speeds were very slow, so his music had to be distributed as MIDI files, which are much smaller than recorded audio files such as WAV, AAC and MP3. MIDI files contain no audio information. Instead, they function like a script for a synthesizer, containing not just the notes to be played but also control messages, allowing composers to use model-specific features such as the ability to heavily edit how an instrument is played and activating effects such as reverb or guitar distortion. Almost every model of synthesizer responds differently to these messages (if they respond at all) on top of having different sounds, so playing a MIDI file on a synthesizer other than the one specified by the composer will often result in the music sounding completely different from intended. Like most japanese MIDIs you'll find on the internet, the MIDIs made by ZUN were meant to be played on a Roland Sound Canvas, more specifically the SC-88Pro. Released in the second half of 1996, the SC-88Pro is the successor to the SC-88 (1994) and the SC-55 (1991). The 88Pro became extremely popular among japanese desktop musicians for including many instrument samples from expansion boards for the JV-1080, a highly regarded synthesizer used by almost every professional composer that worked with MIDI in the 90's. While the sounds in the 88Pro lack the depth and expression that they have in the JV-1080 due to simplified instrument programming and some samples being cut down, they still sound familiar enough to fool people into thinking that many game soundtracks made with a JV were actually made with a 88Pro. Some commercial game soundtracks were indeed made with a SC-88Pro though: a few well known examples are Thunder Force V, Ys VI: The Ark of Napishtim, Ys Complete (also in Ys Chronicles as an alternate soundtrack), Kanon, Mother 3 and the Pokemon games for the GBA (RSE and FireRed/LeafGreen). ZUN used the SC-88Pro from 1999 to 2001. In mid-2001 he got the newer SC-8850, which he quickly got rid of (compared to the 88Pro it's just more of the same... but with compatibility issues). In late 2001 he got another new hardware synthesizer, the same one he uses to this day. However, before he got this new synth he had already finished pretty much all of the tracks for Embodiment of Scarlet Devil, Kioh Gyoku and Dolls in Pseudo Paradise using the 88Pro. Since this new synth sounds very different from the 88Pro, he decided to arrange what he had done so far, which became the WAV versions of the music. In other words, the MIDI versions of the EoSD and Kioh Gyoku soundtracks are ZUN's original compositions, while the WAV versions are arranged and sound pretty different. I took special care to ensure that these recordings sound as close as possible to actually listening to the 88Pro in person: All of the annoying loud hiss and distortion you may have heard in other recordings of this synth aren't present in mine. The file names are the same name as the original MIDI files, but they're tagged with the japanese names of the tracks. There are about 150 tracks in total, about 10 hours of music. Important: These files are big. If you have download speed or stability issues, try using a download manager such as Free Download Manager. Also note that these have none of the processing that ZUN does to his current music, so this will sound way quieter than usual. Increase the volume on your headphones or speakers. BTW you should totally get foobar2000 to listen to these. Do you appreciate the time spent on this and want to help these recordings show up higher in YouTube search than the stock Windows MIDI synth stuff? Read this post. If possible, please use the playlists when sharing these videos with others. This makes it easier for people to listen to other tracks from the same game if they want to. YouTube's recommended videos feature has unfortunately become useless for this. The 16-bit FLACs should sound the same as the original 24-bit recordings for as long as no further audio processing is applied. This includes dynamic range processing, equalizing and encoding to a lossy format such as AAC/OGG/MP3. If you downloaded the 24-bit versions previously and you don't plan to do any of that, feel free to delete them and download the zip file above. Re: SC-88Pro: ZUN's MIDIs the way they were meant to be heard. Black: These are average SC-88Pro MIDIs. The instruments aren't very heavily edited and the use of 88Pro-exclusive stuff is kept to a minimum. Brown: These are MIDIs for the older "vanilla" SC-88. The 88Pro is able to reproduce these perfectly, as it comes with all of the old instrument samples and the same synth engine as the SC-88. Red: Also for the SC-88Pro, but the instruments are edited and there's heavy use of 88Pro-exclusive features. These sound off on any other synthesizer. The closest to PCB-era music. Purple: These tracks were originally composed for another synthesizer, but ZUN also made a quick SC-88Pro version. Quality may vary. Polished and arranged versions of the first Seihou's soundtrack. Posted on ZUN's site. The music as heard in-game. These have a heavier feel than the arranged versions. The music for the trial is slightly different from the final version. The boss themes have the most noticeable differences. The TXT file for Dream Express says it was arranged for the SC-88, but the MIDI doesn't switch the synthesizer to SC-88 mode. I've recorded both 88 and 88Pro versions. The TXT file for some of these say they were made for the SC-88, but the MIDI doesn't switch the synthesizer to SC-88 mode. I've recorded both 88 and 88Pro versions. ZUN's first published MIDI work, made for the vanilla SC-88. Somewhat different from the FM versions. Originally composed for another synth. ZUN didn't put much effort into the SC-88Pro MIDI versions. ZUN's original compositions for Kioh Gyoku. Most of these tracks are very different from the final WAVs. Oh oohh these are such a treat, wonderful job with these! Missing a few personal gems, but I'll keep them to myself until you seem finished with your project. I'm curious, how were you able to determine which version of the synthesizers they were meant to be played on? This is a substantial contribution to the fanbase. Ooh, voting for EoSD... Because vampires. By the way, is 24-bit FLAC really needed? Most of the guys I know just go with 16-bit FLAC. Thanks. The MIDIs from most japanese sites come in a .lzh file (it's like a zip or rar) which include both the MIDI and a text file. The text file will usually tell you which synth/playback mode the MIDI was made for. The manual for the Windows Touhou games actually list the SC-88Pro as a system requirement if you want to play with MIDI music. 16 bit FLAC is more than enough for stuff like CD rips and distributing your own finished, mastered tracks online, yes. In these cases 24 bit is just a waste of space. Since these tracks are unprocessed (they aren't "mastered", making them quieter than average), I decided to record them in 24 bit to give people the freedom to do the processing themselves if needed for stuff like danmakufu projects. Man, this is amazing. Good job! My vote goes for Shuusou Gyoku. This looks very interesting. I can't wait to listen for myself. I want more, and perhaps try the EoSD-IN MIDIs with your SC-88Pro? I'm curious as to what it sounds like. EoSD will be done, but I'm unsure about recording PCB and IN. That would be another day or two of recording/editing/tagging files but ZUN obviously made the 88Pro MIDIs for the two games in just a few minutes so they don't sound very great. Maybe I'll just record the tracks from web trial. We'll see. Oh me, oh my, this is amazing, the sound is so clean! 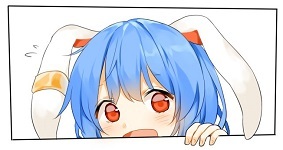 I voice for PoDD, it has best ost from PC-98 era in my opinion, and I don't really care about Seihou. -ZUN's site: http://www16.big.or.jp/~zun/html/music_old.html This is all done except for the arranged Shuusou Gyoku tracks around the middle of the page. -The games that come with a MIDI version of the soundtrack: SoEW, Shuusou Gyoku, Kioh Gyoku, EoSD, PCB, IN, PoFV trial. There's nothing left to record from PoDD since it doesn't come with a MIDI version of its soundtrack, sorry. Around the time ZUN was making music for the PC-98 games and Shuusou Gyoku, he was using a bad japanese MIDI sequencer (sequencers are the precursors to today's DAWs, the kind of software that everyone uses for MIDI these days, unless they're clueless) which made making MIDI versions of his music very slow and awkward, so he just didn't bother. The only PC-98 Touhou game that came with MIDI music is SoEW. Oh man these sound so good. Well done. Your recording of The Legend of KAGE has a slower tempo than the in-game & untouched score versions, is this expected? Still sounds awesome, but just curious. Ah, that's too bad. Well, I'll guess I'll just stay with other stuff you upload. ZUN arranged most of these to varying extents, so expect to hear little changes such as that one. In Legend of KAGE's case, recordings of instruments are more complex than the simple modulated sine waves used in the PC-98 games, so he had to slow the tempo down to prevent the track from sounding like a mess. I have uploaded the original soundtrack for the first Seihou Project game, Shuusou Gyoku. It's at the top of the list. Note that these are different from the arranged versions from ZUN's site (not uploaded yet). Like all of ZUN's music, these have more of an impact if heard while you're playing the game. Since this game only supports MIDI music, the closest you can get to that is changing the music manually while watching someone's (muted) run on YouTube or Niconico, keeping in mind that all 3 of the final boss' forms has its own theme. Try that if you have some free time. I just downloaded the Witches Ball ~ Magus file and it sounds so much softer ( in a good way ) and clearer than the one you can find on youtube!! I uploaded the music for the C58 trial version of Shuusou Gyoku. Yaaaaay. I also added where each track is played, and turned the ugly track list into an ugly table. That took a while to do (and lots of trial and error to get it to look the way I wanted it to) but hopefully it will make things less confusing to look at. Just signed up here to say thanks for the effort put into this. Great job! Oh man, this project is great! Thanks for your hard work. This is great. Excellent job and keep'em coming. 東方封魔録　～ the Story of Eastern Wonderland (TH2) MIDI with SC-88Pro should be very interesting. For the sake of completeness, if you can tackle PCB, IN, PoFV midis, that would be super special awesome. I am in love with this thread and have been sharing it around. The sound of these files is amazing and as a lover of pc98-Touhou and the other ZUN songs of that time in general I felt like it was early Christmas. Like this, I finally get myself to actually comment on this, but because of what else but a complaint. It seems Primrose Shiver (the C58 Trial version) has been deleted from mediafire or is otherwise not available. If you could re-up it, that would be great! Looks like mediafire was having some minor server issues a few minutes ago, but hopefully everything should be back to normal now. Also, I'm voting for Kioh Gyoku because nobody else does and I really wonder how different these versions of the tracks are. The link to Girl's Divinity ~ Pandora's Box says it was removed. Thanks for the heads up. No idea why mediafire keeps doing that, but it seems that simply reuploading the track makes the original link work again. These are great! I really appreciate hearing the original intent ZUN had in mind for these songs. I've played the PC-98 games and some of the songs are good in-game but ultimately suffer due to the disk space. To bad there aren't more original MIDIs of Mystic Square. I love the music form that game (like Plastic Mind). Here's the MIDI version of the soundtrack for the second Touhou game, Story of Eastern Wonderland. It's kinda rough around the edges since ZUN didn't have much experience with MIDI back then. The MIDIs for this game were made for the vanilla SC-88 rather than the SC-88Pro, and sound noticeably different from any of his future styles. A lot has been happening lately so this took a lot longer than usual. Sorry about that. I recently got a really good new keyboard, Cubase Pro 8.5 was released, I've been reading two nice books, I've been learning a lot of new things... And soon I'll be getting a Roland U-220 along with most of its expansion cards and maaaaybe a Roland JV-1080, because what's responsible spending? Hopefully I'll be able to finish recording all of this before 2017. Alright, next person to post gets to pick what gets recorded next, Kioh Gyoku or EoSD. As stated in the first post the MIDI versions of these soundtracks were originally going to be _the_ OSTs, and they both sound quite different from the final WAVs. Not only were recorded recorded from a different synthesizer, they also have different instrumentation and use of effects. For the glory of House Scarlet, I pick EoSD! Page created in 0.388 seconds with 40 queries.